Photo by 123rf.com. Used by permission. Multiplying small groups is difficult. Multiplication involves developing leaders within a group in an effort to start new groups. Some methods of multiplication involve group members leaving the group to start new groups. “Multiplication” really becomes a euphemism for division. For many groups in North America, multiplication like this is unwelcome. Many churches I’ve coached and the two churches I served on staff have experienced multiplication efforts as subtraction. We weren’t multiplying groups. We were losing groups because no one wanted to multiply. Or, more accurately, we were losing the opportunity to multiply. In my days of handpicking group leaders, pushing an apprentice model, and encouraging group multiplication, I faced considerable pushback. Members didn’t want to leave groups. Group leaders couldn’t identify an apprentice. I ran out of people to handpick. Our groups were stuck with only 30 percent of our congregation connected into groups. Then, out of frustration, we discovered something that worked. I have not personally recruited a small group leader since 2004 (and I served a whole other church since then). How do you multiply groups without recruiting leaders? You engage the senior pastor. Whether you hand a copy of Transformation Groups to your pastor to show him how groups can solve most of your church members’ needs or create video-based curriculum with your senior pastor’s teaching, there is no better spokesperson for groups than the senior pastor. When we created a video-based curriculum that aligned with my pastor’s message series, we were giving our people more of what they already wanted – our pastor’s teaching. When he stood up on a Sunday morning and invited people to open their homes and host a group, we doubled our groups in one day. Semantics aside, we had never seen groups multiply so fast. Small group pastors and directors at best will recruit only 30 percent of the leaders that the senior pastor is able to recruit. How do I know? After seven years of personally making the invitation to lead, our church had only 30 percent in groups. When my senior pastor made a similar invitation, our groups jumped from 30 percent to 60 percent the first time around. Within six month, we had 125 percent of our average adult attendance in groups. My pastor recruited every leader from 31-125 percent. Up until the day our groups doubled, I coached all of the leaders myself. In many ways, I had become the “lid” on our small group ministry. The limited number of groups we had at that point was a true reflection of my leadership. As Andy Stanley says our system was perfectly designed to achieve the results we were getting. We were stuck because I was the bottleneck, so I stopped coaching the leaders. Instead, I handpicked a leadership team of six coaches to help me lead the small group ministry. This felt like a risky move because things were moving so fast that I couldn’t keep up. As their pastor, I had to admit that I didn’t have it all figured out and that I needed them to figure this out with me. They were up for the challenge. We led together, and it’s one of the best things I’ve ever done. They coached the leaders. I led the leadership team. Our groups multiplied. 3. Stop Assigning People to Groups. There are a lot of reasons to assign people to groups. It’s efficient. It’s easy. It helps to prevent combinations of troublemakers from meeting together. It’s a pure expression of control. Yikes! Assigning people to groups, sign up cards, websites, and group directories are all efficient ways to place people in groups, but they aren’t effective. The wheels fall off these efforts simply because these are task-oriented approaches in forming relationally-based groups. Do you see the problem? Instead, when people offer to host a new group, their first job is to recruit people to join their group. By making a list of people they know, praying over the list, and personally inviting these folks, groups filled up quickly and stayed together for a second study. Make opportunity for those who aren’t invited to a group to meet the group leaders and join a group. In a church of 800 adults, we connected 1,000 into groups without sign up cards, websites, or directories. In the churches I coach (both larger and smaller) this has proved effective in forming lasting groups. We broke the rule of attempting to recruit and train one apprentice. I learned from Brett Eastman and Lifetogether to “apprentice” the entire group. Everyone chose a responsibility to host the group in their home, lead all or a portion of the study, bring refreshments, plan outreach events and parties. Potential leaders were much easier to identify when they were put into action rather than picked out of a lineup. As groups grew, some left to start a new group. There was no mandatory splitting of groups. They just got too big for the houses they were meeting in. Honestly, 14 years ago, I didn’t believe this would be my story. Once we implemented the principles I shared here, I couldn’t believe how easy it was to multiply groups. Now, I’ve seen this story multiplied across over 1,500 churches that I’ve had the privilege of coaching. Schedule an assessment to get insights into how to accomplish this in your church. Easter is only 12 weeks away. Did I scare you? Now, you may be one of those pastors who plans everything in advance. Good for you. But, you might be like the pastors at one church I served where Easter always seemed to take us by surprise. How many services? How do we promote? What is our theme? Who is leading worship? How can we get them back after Easter? If those are your questions, you are in good company. Every pastor wants to see new faces on Easter Sunday, and maybe even a few faces that haven’t been seen for a while. But, once you get them to the service, how do you keep them? How can they be connected? How can new believers be effectively discipled? These are important questions. Let me offer three tips to connecting your Easter crowd. 1. Everyone attends Easter Services. Easter is the day when everyone who calls your church their home church shows up. Whether they are members, regular attenders or CEOs (Christmas and Easter only), Easter is the day they all come. This presents a unique opportunity for launching groups. More than any other season, Easter is the time when everyone can hear the invitation for groups at the same time. While Christmas offers a similar opportunity, the end of December is not a great time to talk about the New Year. Your people just aren’t there yet. But, Easter gets everybody in the room and offers a window to start groups and get people to come back on the Sunday after Easter. A few years ago, we created a video-based curriculum called Hope Rising for Eastside Christian Church, Anaheim, CA with Pastor Gene Appel. They handed out a copy of the study guide to everyone of the 7,000 people who attended Easter series. When it was all said and done, Eastside launched 460 groups for that series. Now you may not have 7,000 people, but you could have 65 percent of your people in groups like Gene did. While some may have some misgivings about launching groups toward the end of the school year, the reality is when you have everybody present for Easter, you really can’t pass up that opportunity. If you offer these groups a next step, even if it’s in the Fall, as many as 80 percent will take you up on the offer. I served one pastor who used to end the Easter services by saying, “And, if I don’t see you in the near future, I would like to wish you a Merry Christmas.” We can have a bad attitude toward our “Christmas and Easter Only” crowd, but let’s not rule them out just yet. When you think about the people who occasionally or rarely attend your services, wouldn’t you like to get them more engaged? Now think about this, who are their friends? Most likely they have far more friends outside of the church than inside the church. That’s great news for starting small groups. If you invite them to do a study with their friends, you can begin reaching people who’ve barely darkened the door of your church. Rather than inviting your CEO’s to join groups with church people, offer them a way to connect with their unchurched friends and do something intentionally to grow spiritually. The group experience will lead them to the worship experience. At Harvest Church in Byron, GA, Pastors Jim and Jennifer Cowart used a strategy they called “Grab, Gather, and Grow.” The idea was to grab an easy-to-use curriculum, gather with a group of friends, and grow spiritually. Their congregation of 2,500 took them up on it. Some 5,000 or so friends were gathered for these groups. Many of those friends started attending the weekend services as well. So often we think of groups as an assimilation strategy or discipleship training, but groups are very effective in reaching out to others in the community who may not have a connection to the church, but do have a connection to someone in your church. By giving your members, and even your CEO’s, permission and opportunity to form a group with their friends, more people could end up in groups than in your services. Groups can become an entry point to your church. 3. Your Senior Pastor is the Key. If your church creates curriculum based on your pastor’s teaching, you’re just giving your people more of what they already want. There are a variety of ways to do this. You could pay someone tens of thousands of dollars to do this for you. If you’re interested in that, I could recommend someone. But, you could also map out your own series, shoot the video, edit the video, write the study guide, design the study guide, and then duplicate everything yourself. That may sound daunting, but some churches are producing curriculum with an iPhone. A third way is to add your pastors teaching to a series that has already been created like All In. However, you create your video-based curriculum, that teaching along with your pastors invitation on Easter Sunday will create more groups than you can imagine. While you’re in the process of calculating how many lilies and eggs your church will need, don’t miss out on the opportunity to launch groups off of Easter. Not only will unchurched people participate, but the Sunday after Easter won’t see the dip in attendance it usually does. 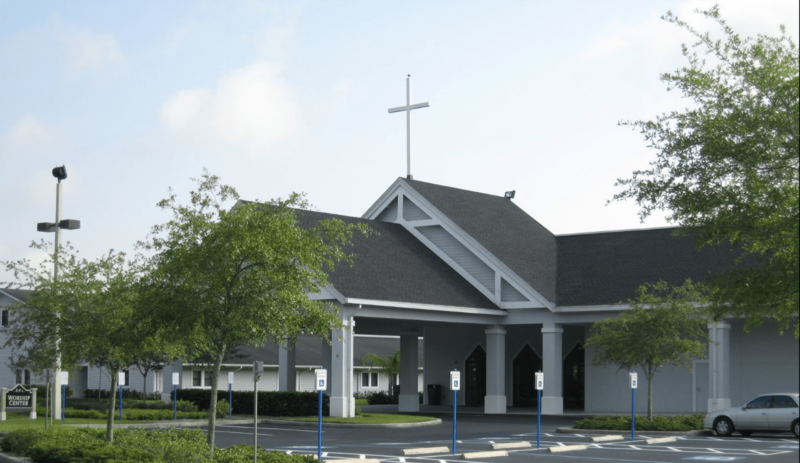 Van Dyke United Methodist Church is a 25 year old church in Tampa, Florida pastored by Matthew Hartsfield, who has lead them for 18 of those years. As of this writing, their weekend adult attendance averages 1,800. Three weeks ago, they had 39 home groups with approximately 400 group members. That was three weeks ago. Today, everything has changed. What started as a strong Fall series called Q&A quickly morphed into a discipleship and evangelistic tool placed in the hands of Van Dyke’s members. Pastor Matthew had crafted a series to answer life’s big questions, such as: What is God’s Will for My Life? Why are there so Many Different Religions? and What Happens the Minute After You Die? The weekly messages definitely had a broad appeal. The congregation would be eager to bring their friends to the weekend series. Then, Pastor Matthew created a tool to take the message to the community. With just four weeks until the series launch, Pastor Matthew with the Van Dyke team created an easy to use DVD-based curriculum in partnership with Lifetogether. In one day, they shot six teaching segments, six session intros, and six leadership training segments. That’s a lot for one day. In the next 10 days, Lynne Fukutani and Rob Rose used the Lifetogether template to create a complete six-week study guide. In addition to great discussion questions, they included the support and training any new leader would need to start their group. They were off to print. The day after the shoot, Pastor Matthew engaged in a crucial next step conversation. The video was recorded. Now what? On the next two Sundays, he challenged the entire congregation to host a group in their homes. With a little tongue in cheek humor, he assured his members that “All you need to do is push play and brew a pot of coffee.” In two weeks, 63 new host homes (and host workplaces) were created. From an established base of 39 groups, Van Dyke Church now boasted 103 groups in just two weeks time. And, they’re just getting started. The success of new hosts and leaders depends on the encouragement of a coach. Three weeks ago, Van Dyke Church had only one staff member who coached all of the groups. This system was quickly overwhelmed – not to mention the staff member. We challenged key staff members to think of the influencers in the congregation. Brett Eastman calls them the “E.F. Hutton’s.” (Brett’s getting a little old.) In a matter of 15 minutes, Pastor Matthew and his staff had cherry picked the top candidates in their congregation. Then, the pastor picked up the phone and invited these influential folks to help the new group hosts for the six weeks of the campaign. They pulled the new coaches together for a 45 minute huddle and outlined the expectations: (1) Call the new host once a week. (2) Answer their questions. (3) Pray for them. They agreed. As soon as the coach meeting ended, the new hosts filed in for a host rally. We built up the curriculum, built up the team, and built up the church. Then, we introduced the new hosts to some very important people who would help them get their group started – their coaches. A little less awkward than the junior high dance, each new host was paired with a coach. They talked briefly, exchanged contact information, and they were ready to start. Immediately after each weekend service over the next two weekends, the new hosts were arranged in the church lobby by city and zip code. As prospective group members filed out of the services, they met a group host who lived near them and signed up for their group for the six weeks. While most group prospects found a group to join, a few were lost in the shuffle. The coaches and church staff were on-hand to direct these lost sheep into the right place. By the end of the first weekend, Van Dyke Church had nearly doubled their group participation. By the second weekend, they were close to tripling that number. Their group members had grown from 400 to right around 1,000 in groups. And, new people are being added daily. In connecting their congregation into groups, Van Dyke Church leveraged existing groups, formed new host homes, created “family and friends” groups, and marched off the map of what was known as group life in their church. They even discovered a few groups who were meeting under the radar, but identified themselves for this series. Now, they are tackling the last 30 percent – the independent, the introverted and the isolated (Read more about these groups here). Rather than arranging another week of small group connection in the lobby, the Van Dyke team is giving away DVDs and books to anyone who will do the study with two or three friends. These off-the-record groups will accommodate folks whose schedule doesn’t fit with a typical group. Introverted people can do the study with the friends they already have rather than face a group of relative strangers. Independent folks, well, they can do whatever they want within reason. Lynne Fukutani, VDC’s small group director, already posts a weekly discussion guide on Van Dyke’s website called the AfterWord. This is available for any group or individual to apply the weekend message in a practical way. Participants in the church’s internet campus viewed the messages from near and far, then downloaded the AfterWord for study and discussion. Who said a Bible study had to come in a book? This led to another question. Who said a teaching video had to come on a DVD? By uploading the teaching videos to their site, the staff now embeds the video on the AfterWord page of their website. Now, anyone can study along with Pastor Matthew in the Q&A series at no cost to the church or the participant. What started as a pastor with an interesting sermon series led to the multiplication of those messages through group curriculum and online resources. A pastor who believed in small groups became the champion for groups in his church and increased their group leaders by nearly 200 percent. Faithful members, who have studied God’s Word for years, got their gifts in the game by opening up their homes. And, members, who sometimes got lost in the shuffle after the service, are connected into community by the hundreds. This was just the beginning of the Van Dyke story. By the end of their third series in that ministry year (Fall launch, New Year’s Launch, Easter Launch), they had connect 2,000 adults into groups with only 1,800 in their weekend adult attendance.